The Tacoma Mountaineers Annual Potluck and Awards Dinner is scheduled for Saturday, Oct 17, at 6pm. Our Annual Potluck and Awards Dinner is scheduled for Saturday, Oct 17 at 6pm. Please plan to join your fellow Mountaineers for an evening of community and fun! 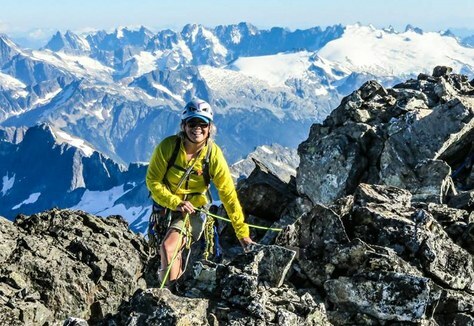 Julie Myer, a Tacoma Mountaineer and peak bagger, successfully completed the "Rainier 100" in September 2015. The Rainier 100 include seven climbs, 78 scrambles, and 15 hikes that are within and immediately adjacent to Mount Rainier National Park. Initial efforts were to complete the 24 Irish Cabin Peaks, a Tacoma Branch tradition. Inspiration and direction came in the release of the "Guide to 100 Peaks at Mount Rainier" by Mickey Eisenberg and Gene Yore; and Peakbagger.com. In 2013, she completed 21, 44 in 2014, and 16 in 2015. Adventures include cold late night summits of Tokoloo Rock and Andrew Benchmark, a near emergency bivouac on 3rd Mother Mountain, early season spindrift on Banshee, a glorious loop to complete Old Desolate, Crescent, and the Sluiskins; and finally #99 and #100 (despite a seeming previous pact with Mother Nature) - the wettest and most miserable of all! These and others will be highlighted through photos, maps, and stories.